Welcome to the site, JwKeen. You have some nice sets completed and almost completed. - T205 44/215 (20%) with almost all SGC 40/PSA 3 including Mathewson, Wheat, Speaker, both Chases, Jennings, Marquand and Wallace w/ cap. 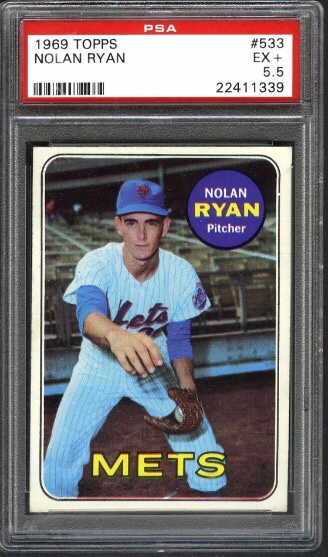 - 1969 Topps Complete with the pick up of a PSA 5.5 Ryan. Set is EXMT-NM. Plus a bunch of sets from 1980 up through early 1990's in MT. Last edited by Big Six; 08-28-2017 at 09:28 AM. I just completed 1979 topps!!!!! This is my birth year set. Congrats, it is always nice to finish a set. I am down to needing just 8 more 1955 Bowman to finish my low end set thanks to 2 recent purchases. Congratulations Matt! Nice card to finish off the set. What is your next project? Scroll up a couple posts...couple '70s sets likely to fall next. Thanks! Finished off my 1946 Topps with #251 Yankees Team. Now on to 1951 blue back, 1952, & 1953 to finish out Topps run. If one does a Topps run, should it include the 1948 Magic Photo baseball subset ? If not, should it include 1951 ? if so, which of the 5 sets from 1951 is needed for such a run ? If you are continuing the run, which set from 2017 would extend the run ? Last edited by ALR-bishop; 09-19-2017 at 01:44 PM. I don't know. To each his own I guess. Just finishing up 52 is going to be a big enough job. I'm just getting into vintage and trying to move/sell/give away my modern to make room and money for vintage. With that in mind, I'm just getting started into sets. I have an array of vintage (about a 2-row shoebox worth), but not many of any certain year. The closest I am is I have about roughly 440 of the 1974 Topps baseball set. Not sure I will continue toward that set, but I probably will. Other than that, I have about 70 different from 1962 Topps baseball and about 40 each from 1972, 1973 and 1975 Topps. Also have about 25 different from 1957. So those will be next few sets I decide to work on. I did the Red Back and Blue Back sets from 1951 Topps. I considered the team cards and all stars as inserts. No to 1948. I was going by Topps, in 1975 they said it was their 25th anniversary 1951-1975 and they had the subset of MVPs with Topps cards. They included 1951 with the Red Back Yogi Berra and a mock up of a Roy Campanella. Base Topps for 2017 and every other year. As hot as the update cards are, you should get those too for the years that they exist. Last edited by rats60; 09-19-2017 at 06:06 PM. Need Aaron and Kaline rookie cards to complete my 1954 Topps set. I am doing exactly the same. Have already completed the red backs. I started the 1972 Topps baseball set in June and received some advice from members of this board that I should begin with the high #s to knock them out first since they are quite “challenging”. This turned out to be great advice and I am very excited to report that I ordered the final 7 cards of the last series today! I am pretty pumped about this and look forward to completing the set in 2018. So I figured that I would share what I have going on. 1959 and 1960 Topps baseball. I have also decided to put the 1958 set together. I have close to 30% of the set, so that will keep me busy. Will continue to pick up many cards from our members here. I am now down to 94 cards for my Topps run of sets. Need 36 for 1953, 42 for 1952, and 16 for 1951 Blue Backs. Will still take a little while to finish all of these. Impressive run. I am back to '54 (with a few Bowman sets as well). However, even though I have 99% of the cards, I probably only have 40% of the value - as a complete '52 in ExMt will cost me more than what I could sell everything I have for. My 1961 set finally surrendered today when I found a good Al Kaline AS card as the final card. So my number is 17 cards to complete my version of Topps Run ...1952-1980 without the 52 Topps high numbers. My only variations are the 62 Greenies. I thought I would end 2017 with a single digit number, but I haven’t been focusing on this run, in favor of some more prewar goodies. I am doing Bowman as well. Have a little further to go there. I have 48,51,52,53 color and 55 completed. I need 40 cards in 54, but still have a ways to go in 49 & 50. Also have just started 53 black and white. I am interested on why you have so many 71 Topps FB sets. I do the same thing with some cards. There are some error cards I have 30+ copies of the same exact version. I have no good answer on why I do it. If I see one way below normal price I buy it and add it to the stack. I don't have a focus, per se, except that I want anything I don't have in true ex-mt/nm that are decently centered in any year. Actually, I love 1958, 1959, and 1961 the most right now. Attached is my progress as of yesterday. I have 50, 53 Color, 53 B&W, 54, and 55. 52 is next on the list for Bowman and I am hoping to do 53 Topps in 2018 as well. Just finished the '56 Topps set with a little help from a board member. Going to try to wrap up a '71/72 basketball set and start looking for another set to tackle. Choices are '55 Bowman, '64 or '65 Topps or maybe another football set. If anybody wants help finishing sets pm list or link if up to date. I'm a cardshop that has been in business 40 years and just now selling online. I do not have graded cards besides a couple bvg basketball I picked up in a lot. So if you are in need of raw let me know. It is good to know that there are others that have the set collecting recessive gene. For me, I always had a goal of completing the entire Topps run from 1952-1992 (when cards really became a whole different world than what I fell in love with as a kid). After finalizing the T206 set completely PSA graded (but for the big 4) I decided to go after the PSA "big 3" sets so now working on a PSA graded 1952 set (14.5% complete) and PSA graded 1933 Goudey set (8.75% complete). Furthermore, because I am completely looking for a painful set I decided to throw in working on completing the 1914 Cracker Jack set as well (78/144). As a child, and collector, of the '70s, those are the sets I am working on. I am close or complete with most of the hockey and football, but have only the '74 and '76 complete in baseball, with fifty to go on '77. I have greatly enjoyed the process of building, or mostly rebuilding, these sets, and will expand to basketball when I'm a little closer to closing out the rest. I admire you guys who are working on and completing the sets of the '50s and '60s, maybe I will get there some day. But for now, I'll enjoy my journey while admiring the pick-ups that get shown on the board. Very impressive collection. Good luck on your quest to finish other sets. I just purchased the last card for my 1972 Topps baseball set this morning! (the #559 Pete Rose card). I have enjoyed putting this set together, but it is a beast. While I posted that my current auction is open on the main board this morning, most people think of it as a pre-war auction. I would like to post here to let you know there is a large number(nearly 200 lots) of starter sets, partial sets, groups, singles and complete sets from 1952 Topps thru 1972, along with some Bowman and Fleer. All can be seen at www.brockelmanauctions.com and registration is on the front page if you are not already registered. Happy to say I ventured mostly away from graded cards and am currently working on the 1964 Topps baseball and 1967 Topps baseball set (for my dad). Its going to be fun to put together these raw sets and a challenge I'm sure for some of the cards. May also venture into the 1963 and 66 sets but don't have a single card from those years as of yet. Also going to work on a 64 Topps football set. Just wanted to share and enjoy reading others ventures. hit me up if anybody has any extras floating around and we can trade etc..
Robert, is that ALL you have going?? I have also veered to mostly ungraded 60s sets (football right now....getting the itch to build a 60s baseball set---but leary of how many cards are in some of those sets). Some of the "big" cards might be slabbed, but other than that, they are ungraded, and I am loving it! I got on a prewar kick last year (it is now over) and, like a moron, sold off my 2/3 complete 65 baseball set. Wish I had not done that! Right now I am over halfway finished with a 65 Philadelphia football set. After that, it will probably be another 60s football set and probably a 60s baseball set. I am undecided on which one though. I have actually thought about 67 Topps. About what grade range you going for on your 67? Appreciate the kind words! I sold the 65 baseball, not the football. I hear ya loud and clear on paying for those high #s. That is part of what has given me a little pause about the 67s. I have looked on ebay at several of the 67 highs. In many cases, there doesn't appear to be a shortage, I agree. I also will be moving slow, I am sure. Best of luck on all of your projects! I'm sure we'll be talking!! Last edited by vintagebaseballcardguy; 01-22-2018 at 02:27 PM. Appreciate the kind words! I sold the 65 baseball, not the football. I hear ya loud and clear on paying for those high #s. That is part of what has given me a little pause about the 67s. I have looked on ebay at several of the 67 highs. In many cases, there doesn't appear to be a shortage, I agree. Best of luck on all of your projects! I'm sure we'll be talking!! Sounds good brother. I will pull those Phillys for ya........any other football sets your wanting to start. LMK and I will see what I have on hand. I have a hoard of NMMT or better 81 topps football I got from a vending box if you ever wanna start that set. And if you have any extra 67's hit me up. Thanks for thinking of me. I don't have any 67s at the moment. If I end up going that route and end with any dupes, I will definitely think of you. Have fun! Just finished my 54 Bowman set. Trying to finish 53 Topps, need 14 cards. The rest of the 60's I am hovering in the 40-70% range. I have some big cards, but still need a few. 1952 Topps: Only collecting low numbers, Have only about 20 cards so far. Football: I have complete Topps run from 1968-end minus a handful of 1972 High numbers. Completed 1954 Bowman, 1956 Topps, 1958 Topps, 1960 Topps. Need 4 cards for 1960 Fleer. Need a few for 57 and 59. The remainder of the 1960's is all over the place, but most of the sets are in good shape with me having big chunks. I could finish any of them at almost any time with some effort. Got a lot ahead of me. I would like to finish the 1960's for football this year (or come really close) and finish baseball back to 68. But, like I said, stuff happens and I may sork just the opposite. Down to one card for a 1971/72 Topps Basketball set - Tiny Archibald RC. Gotta love the design of the cards and the fact that so many of them feature guys wearing their jersey backwards. After finishing that one, I'm not sure where I'll be focusing on next. Maybe '62 Topps or '55 Bowman Baseball or '69 or '73 Topps Football. Or maybe something else. That is my favorite basketball set of all time. Good choice! Completed 1961 Post, 1964 Topps Coins, and 1961 Topps Stamps recently. Topps regular run (except 1952) complete. Bowman run complete except 1949 (need 43). Working on assorted 50's/60's/70's issues: 1963 Topps Peel Offs (need 4),1972 Fleer Famous Feats (need 5), 1954 Red Heart (need 2), 1962 Post (need 1), 1963 Post (need 3). In pre-war, 1933 Goudey (need 66), 1934 Goudey (need 34), 1934-36 Diamond Stars (need 37), 1939 Play Ball (need 39), 1940 Play Ball (need 55) and 1941 Play Ball (need 1). In the pre-war, updated counts are for 1933 Goudey need is now 29, 34 Goudey need 19, 34-36 Diamond Stars need 19, 1939 Play Ball need 8, and 1940 Play Ball need 11. Also working on the Kelloggs run and only need 16 from the tough 1971 set and 2 from the 1972 set. Finally, have started on the 1948-49 Leaf set - only the non-short prints - need 15 of those. I'm currently collecting a complete Topps base card run of Braves players, starting from 1951. I am currently 95 cards short of reaching my goal. I have everything from 1959 to today, minus 6 Aaron's. Still 60 cards away from completing my 1958 Topps baseball set, but this week I did finish the cool-looking All Star subset. Seven Hall of Famers in a row, cards 482-488: Banks, Aparicio, Robinson, Williams, Mays, Mantle, Aaron. Last edited by geosluggo; 01-27-2018 at 02:22 PM. - 1973 Topps (raw NrMT) missing only 8 cards! Need 100 (Aaron), 142 (Munson), 475 (Cobb), 589 (Forsch), 607, 612, 616 & 654 (Twins). Last edited by Big Six; 02-05-2018 at 12:21 PM.